Peter van Dyk (Class of ‘84), son of Cornelius (Case) and Henrica (Riek) van Dyk, plays a major role in keeping the farm in the family and giving back to their community. Located in West Caledonia, NS, the van Dyk name is widely recognized. In 1954, Case van Dyk and his wife Riek moved to West Caledonia from Holland. With them they brought their farming experience and started Ons Genoegen Farms. At that time, Ons Genoegen Farms concentrated on dairy, although it was typical for them to have a little bit of everything. Eventually they concentrated on farming hogs and in 1977, their operation was a 200 sow farrow-to-finish operation. Case and Riek have nine children- six boys and three girls, many of whom have different ties to the original family farm. Today, Ons Genoegen Farms still stands in West Caledonia and is owned by Peter and his brother, Gerry (Class of ‘77). There are no longer any hogs or dairy cows in sight through. Ons Genoegen Farms is now part excavation company and part mink farm. They also have Christmas tree land and pastures that they lease out. From Ons Genoegen Farms branches a few smaller businesses including the business that produces what the Van Dyk’s are most famous for- their wild blueberry juice. Case and Riek own a company called van Dyk Health Juice Products. The company produces, prepares and sells wild blueberry juice made from Grade A, Nova Scotia-grown wild blueberries. Their juice has no additives, no sweeteners or sugar. Simply, 100% wild blueberries. Case developed the blueberry juice many years ago. Working with agricultural scientists from the Kentville Research Station, they developed the juice that is now known for its delicious taste and major health benefits. 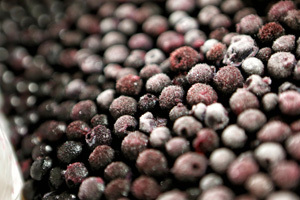 Prior to the juice, the van Dyk’s were harvesting and selling fresh wild blueberries. Because of the equipment used to make the juice, they no longer sell fresh berries as there is not enough space in their warehouse. The juice is made and bottled in a small warehouse down the road from the van Dyk’s “home base,” Ons Genoegen Farms. 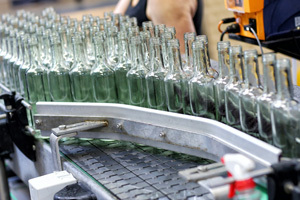 There they employ a crew of five women who produce, bottle, label and package the juice for shipping. 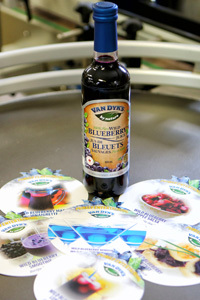 van Dyk’s wild Blueberry Juice is shipped to countries all around the world. Peter explains that China and South Korea are two of their major customers. They also ship all across Canada and some to the United States. Their product is so popular, the van Dyk’s are looking at new product development to expand their line. Although the juice company is owned by Case and Riek, the ownership will soon be transferred to Peter’s brother, Leo. The van Dyk’s don’t get caught up in ownership technicalities though- they all pitch in to help to keep things running as if it were their own farm. 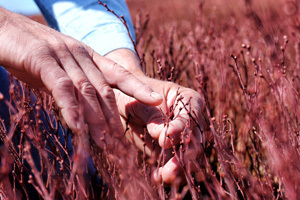 The van Dyk’s currently have around 500 acres of wild blueberry land. They are also working on preparing another 100 acres to bring into blueberry production. They have land in Queens County, Annapolis County, Digby County, Shelburne County and Yarmouth County. Not only do Case and Riek have children working on and taking over parts of the farm, they have grandchildren now beginning to enter the picture. Peter and his wife Kim (Class of ’87, Dalhousie University Class of ‘90), a science and math teacher at North Queens Community School, have three children. Their oldest son, Nicholas (20) is a graduate of the Nova Scotia Community College where he studied mechanical engineering. Their daughter, Nichole (19), just finished her first year at Dal AC. She is studying Agricultural Business and is expected to graduate in 2018 with the intention of returning home to the family farm. Their youngest son Jacob (15) is in grade nine but already has his sights set on attending Dal AC. And that’s what makes the van Dyk farm so unique. When their children want to return, they make room, even if it means expanding to create yet another branch of the business. In Nichole’s case, Peter explains that they are looking to add an apiary to the business. Yet, with so many different companies branching out from each other, the van Dyk family still manages to run everything smoothly as one. Not only is family important to them, the van Dyk’s also stress the importance of community involvement. As their businesses grow, Peter explains that it important to the entire family to always give back to their community. They are loyal to local businesses, buying as much as they can locally and supplying community members with many jobs. 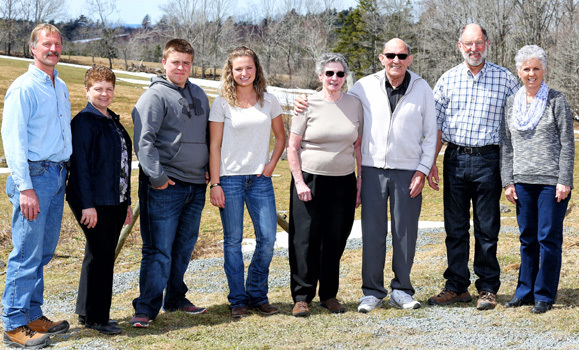 From working on the mink farm and the juice plant, to the construction company and harvesting blueberries, the van Dyk family employs over 30 people. Peter also explains that they can see that number moving to 40 people in the next few years. The van Dyk’s community involvement does not go unnoticed. Last year, Nichole was selected as Volunteer of the Year for Queens County. She travelled to Halifax to represent Queens and receive her award. This year, Peter and his niece were both selected. 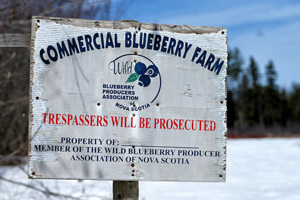 In 2012, Case was induced to the Atlantic Agricultural Hall of Fame and in 2011 was presented with the Wild Blueberry Producers Association of Nova Scotia (WBPANS) Recognition Award. In 2014, Case was also awarded the Business Achievement Award for Queens County. While the van Dyk’s may be busy, their eyes are always open for new opportunities within their community and within their family. From their volunteer work, to the opportunities they provide for community members and their family, the van Dyk’s are known for their kindness, their generosity, and their delicious blueberry juice.